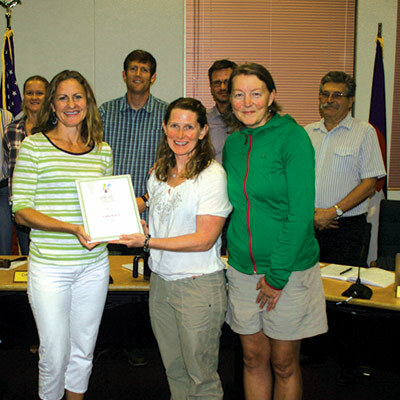 LiveWell Colorado is proud to award Elite Status to the Town of Carbondale for its commitment to building a healthy community. The city achieves this milestone recognition from LiveWell’s HEAL Cities & Towns Campaign for advancing healthy eating and active living (HEAL) policies that help make Carbondale a healthy place to live, work, and play. Julie George, director of LiveWell’s HEAL Cities & Towns Campaign, agrees: “Carbondale has made a significant investment in building a healthier community by working to improve access to healthy food and active transportation for its residents,” she said. There are four levels in LiveWell Colorado’s HEAL Cities & Towns Campaign: Eager, Active, Fit, and Elite. In order to qualify for Elite status, a city must have adopted at least five healthy eating and active living (HEAL) policies since joining the Campaign. Added health to the safety committee to create the town’s first Health and Safety Committee (February 2016). Town staff meetings that cover mandatory safety training have an added component of a health and wellness presentation on the agenda. Parks & Recreation department employees present information about the benefits for town employees regarding fitness class offerings, recreation center passes, and how to access and use the recreational amenities available to them. Conducted a trails and sidewalks needs assessment (March 2016). This work identified trail and sidewalk connections that would be eligible for future funding and would enhance the public’s connectivity to recreational amenities, parks and community gardens. Many of the connecting pieces have been completed with grant funds and community partnerships. Completed sidewalks and trails connecting a local park, community garden and bread oven, and the converted school nonprofit Third Street Center (December 2016). A collaborative project that created two trails connecting existing bike paths and sidewalks to the Bonnie Fisher Park, giving pedestrians multiple access points through the park to a community garden and to the Third Street Center. The Third Street Center is a former elementary school turned mixed-use facility that models sustainability in its design and practice and brings together a diverse collection of nearly three dozen nonprofit organizations, artists, and health and wellness businesses under one roof. Created a summer garden boot camp for kids and master garden program (summer 2016-17). The city provides scholarships for low-income residents, and the program also provides low cost food preservation classes. The garden boot camp teaches children ages 5 and up gardening skills, plant identification, and nutrition education. Growing Vegetables – from (A)rugala to (Z)ucchini is a five-class series on best practices for gardening in the Roaring Fork Valley. The city provides land for the local farmers market (summer 2016-17). The Carbondale Farmers Market takes place every Wednesday from 10 a.m. to 3 p.m. from June through September in the 4th Street Plaza Park in Downtown Carbondale. Additional access to fresh, locally grown produce has been expanded to Main Street during the city’s First Friday evening celebrations. Received grant to provide cooking classes and produce to 10 low-income families (summer 2017). FarmRX is a grant-funded collaborative nutrition program. Families attend four to six classes provided by Cooking Matters to learn about nutrition and how to cook healthy meals using fresh local produce on a budget. The program is designed to increase healthy eating and reduce obesity-related diseases. To learn more about Carbondale’s HEAL initiatives, please visit carbondalerec.com. LiveWell Colorado is a statewide nonprofit organization that increases access to healthy eating and active living by removing barriers that inequitably and disproportionately affect low-income communities and people of color. For more information please visit livewellcolorado.org. Colorado is one of five states in the national HEAL Cities Campaign founded and funded by Kaiser Permanente. The Colorado Campaign is a partnership between the Colorado Municipal League and LiveWell Colorado. The Campaign provides free training, tools, and support to help municipal leaders adopt and implement policies in three key areas: active community, healthy food access, and healthy workplace. Since 2013, LiveWell Colorado’s HEAL Cities & Towns Campaign has worked with more than 50 Colorado municipalities to adopt and implement more than 100 policies and infrastructure investments that increase access to biking, walking, recreation, healthy food, and healthy workplaces. For more information please visit livewellcolorado.org/healcampaign.